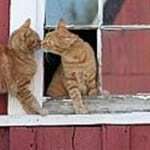 If you are looking for a couple of barn cats to keep down your rodent population, please ask us! We sometimes have cats who are too timid or unsocialized to place in a home environment and we are happy to place them in loving barns – they will be fixed and there is no charge to adopt! Please click here or call the shelter for more information.